The Babi Yar ravine in Kiev is the site of some of the worst massacres of World War II. The first and largest was carried out in September 1941 over a two-day period during which German forces executed 33,771 Jews. Over 100,000 more Jews, Romanis, Ukrainians, and Soviet prisoners of war were murdered throughout the next two years until the Soviets retook Kiev on November 6, 1943. Bill Downs wrote an article for Newsweek in 1943 recounting the second visit to the site taken by a group of Moscow-based war correspondents. New York Times correspondent Bill Lawrence was in the same press party and gave his own account. Both accounts are featured below. The first foreign witnesses this week returned to Moscow from what are probably the most terrible two acres on earth—a series of desolate ravines in the Lukyanovka district three miles northwest of Kiev. The name Babii Yar is going to stink in history. It is the name of the main ravine where the Russians estimate between 50,000 to 80,000 people were killed and buried during the 25 months of the German occupation. From what I saw, I am convinced that one of the most horrible tragedies in this Nazi era occurred there between September 1941 and November 1943. The press party was led by the Ukrainian author and poet, Nikola Bazhan. The Ukrainian Atrocities Commission called three witnesses to meet us at the ravine. 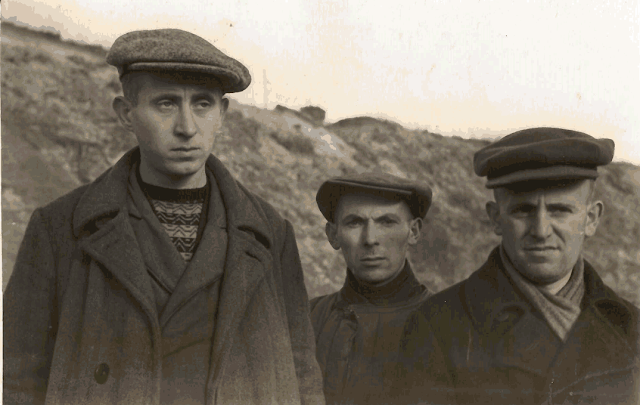 They were Efim Vilkis, 33, Leonid Ostrovsky, 31, and Vladimir Davidoff, 28—all Jewish prisoners of war held in a prison camp across the road. Vilkis did most of the talking, interrupted occasionally by the other two. The first act in the tragedy took place in September 1941, a few weeks after the Germans captured Kiev. One day they ordered all Jews to report at the Lukyanovka district and bring their valuables with them. Thousands of men, women, and children marched out to Lukyanovka, thinking they probably would be evacuated. Instead, Nazi SS troops led them to Babii Yar. As substantiating evidence, while walking over the mass graves, I saw bits of hair, bones, and a crushed skull with bits of flesh and hair still attached. Walking down the ravine, I constantly came across shoes, spectacle cases, and in one place found gold bridgework. The most persistent question that presents itself is why the Nazis took such pains to cover this tragedy. Previously, the Germans made little effort to conceal their pogroms in any occupied territory. If in their retreat they intend to try to cover their crimes, this represents a new and significant policy which presupposes the possibility of defeat. The United Nations declaration regarding war criminals, which closely paralleled Soviet announcements on war crimes, thus can be said to have had its first real effect. The Russians took great care not to damage Kiev, their most beautiful city. That was one reason why the first break-through bridge was built dozens of miles upriver. By outflanking them from the northwest, they forced the German withdrawal. There was no fighting in Kiev and the Germans for the first time did not have time to do their usual job of complete demolition. Yet practically one-fourth of the city has been destroyed, either by Red Army scorched-earth actions or by the Germans. The city's main street, the Kreshchatik, is completely in ruins. However, there are many blocks of apartments and buildings intact. The Germans had a complete municipal organization ready to take over the city at the time the Reds retook it. The plans even included renaming streets such as Doctor Todt Strasse and Horst Wessel Strasse. The Soviet government reached a new high in efficiency in reestablishing Kiev's municipal government. Before Kiev was taken, food stores and sanitation squads established a dump as close as possible to the city. They then quickly moved in. City and regional Soviets were established shortly after the reoccupation. Bakeries were set up and banks opened. Today Kiev looks like an ancient city suddenly occupied by pioneers. It is not uncommon to see workmen packing pistols, and you get used to seeing women, some in fur coats and stylish hats, with rifles slung across their backs. But it is a city of old women and children. The strong and healthy have been exported as slave labor to Germany. Our guide on this tour was Pavel F. Aloshin, chief architect of Kiev and the man charged with rebuilding those parts of the city that had been destroyed in the 1941 fighting and to a lesser extent in the surprisingly swift recapture of this Ukrainian capital on November 6, 1943. Aloshin, who said he had first heard the story of Babi Yar from a boastful German architect, told us how on September 28, 1941—nine days after the German Army took Kiev—all Jews in the city had been told to report to the Lukyanovka district. The Jews, who confidently expected evacuation but not death, were told to bring with them their most valued possessions they could carry. 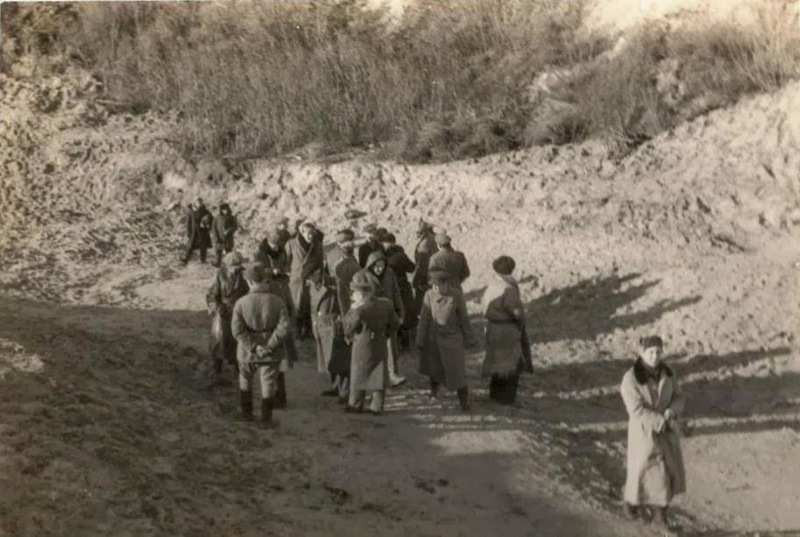 These Kiev Jews obviously disbelieved reports they had heard of German atrocities, and they came to the Babi Yar area bearing their valuables. They expected evacuation, but instead were ordered into the ravine, where they were directed to give up their valuables and also to remove parts of their clothing. Then, according to the story told Aloshin and now repeated to us, the helpless Jews were directed in groups to mount a platform where machine guns were fired at them. Their bodies, he said, were tossed into the ravine and buried there, including some who had been wounded but not killed. There were other correspondents besides me who were skeptical and we asked the Soviet authorities if there were any witnesses still in Kiev who might provide testimony about some of the crimes alleged against the Germans. On the following day, we were escorted back to Babi Yar, accompanied by Mr. Aloshin and Mikola Bojan . . . There we heard stories about the destruction just recently of the disinterred bodies of the Jews and of their possessions, stories related by three former POWs who said they had taken part in these events. The witnesses were Efim Vilkis, Laonid Ostrovsky, and Vladimir Davidoff. Vilkis, an Odessa-born Jew who had worked as a freight loader in Kiev, was the principal witness, but Ostrovsky and Davidoff interjected remarks from time to time that confirmed or added to the account that Vilkis gave to the foreign correspondents. Vilkis said that he has been a prisoner of war in a German concentration camp just across the road from Babi Yar. On August 14, 1943, he said, all prisoners in his camp were lined up and 100 of them were selected by the German authorities for an undisclosed task. Many of them feared they were about to be killed when the Germans herded them across the road and into the ravine of Babi Yar. The POWs, he said, were told to strip themselves to the waist, to remove their shoes and hats, and then were shackled together with leg chains. All three men showed wounds on their legs they told us had come from the shackles placed there by the Germans. Vilkis said they worked at digging in the ravine under the command of SS troops headed by a major general whose name he did not know. The initial digging of several days uncovered nothing, but they were directed to dig in another place by a German officer whom Vilkis said claimed to have participated in the original shooting of the Jews. Now they began to uncover bodies. As the work of disinterring the Jews continued, Vilkis said, other prisoners were sent to an old pre-war Jewish cemetery nearby and told to return with stone grave markers. These markers, he said, were used to form crude stoves. According to Vilkis, the prisoners then carried the bodies of the Jewish men, women, and children they had dug up from the ravine and placed them on the marble foundations. More than 100 bodies comprised each layer, then there was a layer of wood, and another layer of bodies. When the first stove was filled, Vilkis said, gasoline was poured on the firewood and the bodies, but the fire that was started did not burn well because of the lack of draft. Vilkis told how the Germans then sent another group of prisoners back to the Jewish cemetery, this time to tear down and bring back the iron railings around the graves. Back in Babi Yar, these railings were used as grates on which the bodies were placed, thus providing the draft needed to make the fires burn more efficiently. Even so, said Vilkis, each pyre took two nights and one day to burn, and the destruction of the evidence continued from August 19 to September 28, 1943. For the POWs impressed into such labors, Vilkis said, it was a horrid, gruesome experience, and some became ill and others went mad during the long days of work. The ill and the mentally deranged were killed by the Germans as a warning to other prisoners not to become ill themselves. Every day, he said, three to five prisoners were shot. Vilkis gave us what seemed at the time a highly melodramatic story of how some of the prisoners, including himself, had escaped. When the corpses of the original Babi Yar victims had been burned, and most evidence of the crime had been destroyed, Vilkis said the prisoners then were directed to build still more crude stoves. It was clear, he said, that the Germans now meant to silence by death the men who had carried out the body-burning operation in Babi Yar. So an escape plan was hatched. Vilkis said that in going through the clothing of the disinterred Jews, the prisoners had found a few keys including one that a prisoner who had been a locksmith before the war was able to use to open the door of the dugouts in which they were housed at night and also to loosen their leg shackles. By this time, the number of prisoners working in Babi Yar had been increased to about 300, and they made their break for freedom on the night of September 28, breaking out of then dugouts in groups. German sentries outside fired their machine guns into the escaping prisoners, Vilkis said, and he had found a hiding place in a cement factory not too far away. There they remained in hiding until Red Army troops crossed the Dnieper River and came into Kiev on November 6. 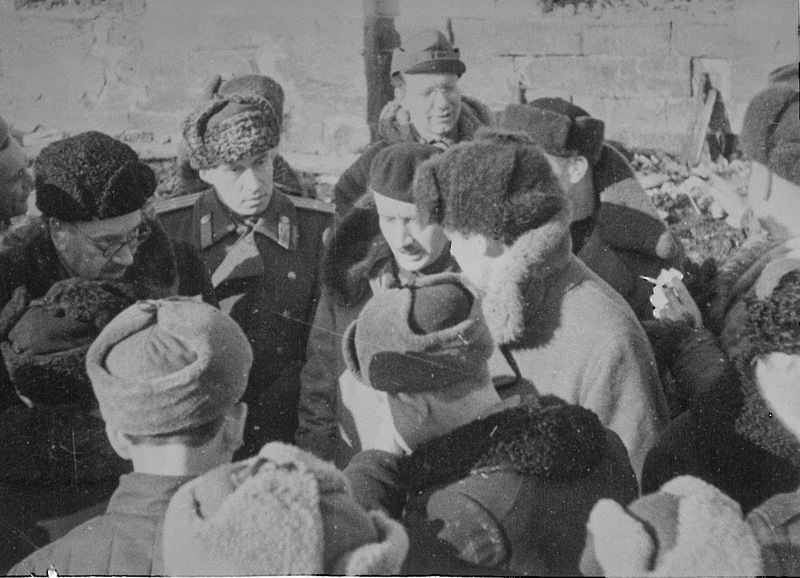 Members of the press party some time later in Rzhev being led by Soviet officials, 1943. 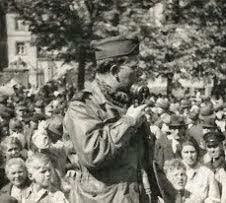 Unlike their counterparts on other fronts in Europe, foreign correspondents were not allowed near the front lines. Their movements were restricted and their reports heavily censored. For the past two years Soviet officials had taken them on junkets around Moscow and surrounding areas. But by 1943 the Soviets made significant gains in their offensive, and reporters were finally able to visit liberated cities and massacre sites and witness firsthand the devastation. Even so, the junkets remained as they were—carefully orchestrated guided tours. Correspondents had to separate the truth from pro-Soviet propaganda. In one instance in January 1944, reporters and foreign dignitaries were taken to the site of the Katyn massacre. The Nazis, upon discovering the mass graves about a year earlier, had used them as a propaganda boon against the Soviets. The trip was an attempt to convince the world that it was yet another Nazi atrocity, though the Russian government later admitted that the NKVD had committed the executions in 1940. Still, most of these trips—particularly the one to Babi Yar—were significant. They gave reporters an idea of the actual scale of Nazi crimes across Europe.
. . . Both men were part of a group of British, U.S., and Russian newspaper reporters who, along with the Kiev Atrocity Commission, heard the account from three Russian prisoners of war who had been forced to participate in the corpse burning in 1943 and later managed to escape from the Germans. The articles differ in tone. Lawrence's is guarded. Given the paucity of evidence after the destruction of the corpses, he stated, "On the basis of what we saw, it is impossible for this correspondent to judge the truth or falsity of the story told to us." Downs, however, wrote, "From what I saw, I am convinced that one of the most horrible tragedies in this era of Nazi era atrocities occurred there." Both men were taken to the ravine where they related slightly different versions of the few scattered bones, shoes, spectacle cases, and bridgework that they observed. Spots of blood on the ground were explained as made by the prisoners who had been shot after they completed their grisly task. (Only a dozen or so prisoners managed to escape out of the 200-300 prisoners forced to do this work.) Where Lawrence used terms such as "isolated" and "scanty," Downs said, "As substantiating evidence, . . . I saw bits of hair, bones, and a crushed skill with bits of flesh and hair still attached. Walking down the ravine, I constantly came across shoes, spectacle cases, and in one place found gold bridgework." Lawrence, however, added, "Freshly excavated earth in the floor of the ravine left no doubt that something had happened there." Successive writers would draw from the words used in both depictions. Lawrence described the site as "Bleak Babi Yar." Downs called the site "probably the most terrible two acres on earth," "a series of desolate ravines," and he said that "the name Babi Yar is going to stink in history." Downs used the word "tragedy" three times. It can be surmised that Lawrence's account contains a measure of disbelief at the magnitude of the action; Downs' one of shock and distress. Both responses are consistent with how many people first absorbed reports of Nazi atrocities. Lawrence reflected in 1972 (p. 92) that "Babi Yar was the first site of an alleged atrocity that I had ever visited, and my skeptical mind simply rejected claims that more than 50,000 Jewish people had been murdered here." News outlets were slow to report on Nazi atrocities. Lipstadt writes that "as late as 1944 eyewitness accounts, particularly those of survivors, were not considered irrefutable evidence even if they came from independent sources and corroborated one another. The press often categorized them as prejudiced or exaggerated." She quotes Kenneth McCaleb, the war editor of the New York Daily Mirror, who explained that foreigners were seen as having an "axe to grind" against the Germans. We are beginning to run into the old atrocity stories again. I tried to tell them in Russia, but no one paid any attention. Now we are finding the same Nazi prisons, the same torture weapons—with some improvements—and the same sad stories of persecution, execution and privation by Hitler's bad boys. I don't suppose anyone will believe these stories either, although we collect and print enough evidence to hang the whole German army. It seems that the Presbyterian mind of the average American cannot accept the fact that any group of people can coolly sit down and decide to torture thousands of people. And if torture isn't enough, then to kill them as calmly as an ordinary person would swat a fly. This refusal to believe these facts is probably the greatest weapon the Nazis have . . . and it will operate in the post-war judgment of the Germans, wait and see. All of us more or less normal people will throw up our hands in horror even at the prosecution of the guilty—because there are so many guilty that we again will think that we are carrying on a pogrom when actually it is only making the Nazis pay for their crimes. Unless it can be brought home as to what the Germans have done in Europe—the cruelty and ruthlessness and bestial killings and emasculations and dismemberment that has gone on—well, I'm afraid that we'll be too soft on them. Several memorials have been erected in the decades since, including one dedicated in 1991 to the Jewish victims fifty years after the first killings began. * The first two photographs are from Bill Downs' personal papers. The Russian-language captions were taken from notes taped to the back of each photo. The English captions include more detail and are thus not intended to be direct translations. The original captions are below. Оставшиеся в живых свидетели массовых казней десятков тысяч мирных жителей, совершенных немцами в окрестности Киева "Бабий яр". На снимке /слева направо/ Вилкис, Островский и давыдовю. "Бабий яр", где проводились немцами массовые расстрелы мирых жителей. Downs, Bill. "Blood at Babii Yar: Kiev's Atrocity Story." Newsweek, December 6, 1943. Lawrence, Bill. 1972. Six Presidents: Too Many Wars. (Saturday Review Press), p. 91-95. Leff, Laurel. 2005. Buried by the Times: The Holocaust and America's Most Important Newspaper. (Cambridge: Cambridge University Press), p. 172. Lipstadt, Deborah E. 1993. Beyond Belief: The American Press And The Coming Of The Holocaust, 1933-1945. (Simon and Schuster), p. 244-248. Peterson, Joan. 2011. "Iterations of Babi Yar." Journal of Ecumenical Studies. 22 September. The Free Library. Accessible at: https://www.thefreelibrary.com/Iterations+of+Babi+Yar.-a0278400312.